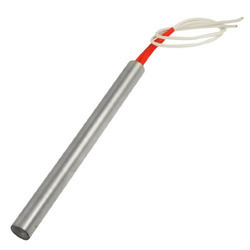 Our experienced and diligent professionals manufacture a wide range of High Density Cartridge Heater, which is widely demanded by our global clients. We have gained expertise in delivering a quality range of High Density Heater. This range of high density heaters is highly required in packaging industry, shoe making industry, marking & sealing machinery and medical & laboratory apparatus. Besides this, the offered range is appreciated for its high dielectric strength, fast heat transfer efficiency and are shock resistant.